Accountability is multi-faceted, and the quest for accountability has become a feature of Irish political and administrative life. Legislation such as the Public Service Management Act 1997, the Exchequer and Audit Departments Act and the more recent 1993 C&AG Amendment Act set out in detail the authority, responsibility and accountability of Secretaries General, and Accounting Officers. This Paper, presented by Mr Robert Watt, Secretary General, Department of Public Expenditure and Reform, examines these current accountability arrangements in place, and sets out the case for a new level of accountability. It explores questions such as: are civil servants accountable enough, what level of accountability is enough, what are the options for further change, and how does accountability link with performance. In doing so, Mr. Watt highlights the progress already made by the Civil Service in building on existing accountability measures, as well as its recent substantial achievements. Let me start by saying that I am very proud to be a civil servant. I feel privileged to be in a position to serve the Government of the day and to assist and advise in the development of public policy choices. These have the potential to have profound and lasting influence on the Irish economy and on the Irish people. And I am accountable for the work that I do. To set the scene for an informed debate on these issues I’d like to spend a moment or two dwelling on the role of the senior civil servant. In a properly functioning democracy, the civil servant should never supplant the role of the Minister. It is the Minister who is democratically elected by the people. The civil servant steers a somewhat tricky course in striving to serve the Government of the day while also adhering to the core values of neutrality, impartiality and service of the public interest. This relationship between the Minister of the day and the senior Civil Service works best where it is one of mutual trust. And there are tensions between the maintenance of trust and the public airing of every difference of opinion which certain interpretations of accountability might demand. No relationship whether work based or private could withstand that level of scrutiny while maintaining mutual openness and trust. It is right that it is the Minister of the day who should publicly promote the merits of Government policy. It is the Minister who will be publicly rewarded at the ballot box for successes and equally will be answerable for policy failures. It is equally right that the Secretary General and his or her senior civil service team should be answerable for their performance. Managing all matters related to the appointment, performance, discipline and dismissal of staff below the Principal Officer grade. Personally answerable to the PAC for regularity, propriety and value for money following rigorous examination of the manner in which I have discharged my responsibilities by means of independent audit by the C&AG. Answerable for the economy and efficiency of the Department in the use of its resources and for the systems, procedures and practices employed for evaluating the effectiveness of Departmental operations. The jurisdiction and powers of the Ombudsman have been strengthened through the Ombudsman (Amendment) Act 2012. Increased use of shared services and public procurement reform. I believe that these changes have and will strengthen both political and public accountability. Yet there remains public and political disquiet that civil servants are not accountable enough. And that is worrying because it erodes trust in the system of public administration and in government. So let me examine the second of those questions – “What level of accountability is enough”? The period since 2008 has been painful for many Irish people from all backgrounds, socio-economic groups and ages. Quite rightly, accountability and the quest for it have become a stronger feature of our political discourse and is the subject of much academic and media comment, and public discussion. The reasons for this are very clear – accountability goes hand in hand with responsibility, trust, ownership, and, where appropriate, blame. The vast majority of civil servants are engaged in delivering services directly to the public. On a daily basis, the Civil Service is judged by the job that it does. Whether it’s the timely payment of social welfare benefits, the processing of grants applications, the organising of second level exams or the collection of taxes – our services are largely transacted in public – and the feedback in relation to the direct delivery of services to citizens is immediate, direct – and brutally honest. It is reassuring to note that in terms of overall performance the quality of Ireland’s public administration is above the EU average. The IPA’s ‘Public Sector Trends 2013’ tells us that quality has been seen to improve in recent times (See Figure 1, Appendix 1). 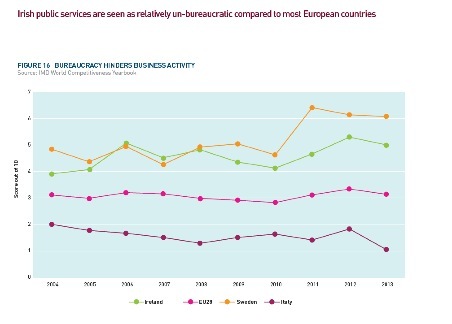 Our public services are also seen as relatively un-bureaucratic compared to most European countries. Only in Sweden, Denmark and Finland is bureaucracy seen as less burdensome (See Figure 2, Appendix 1). 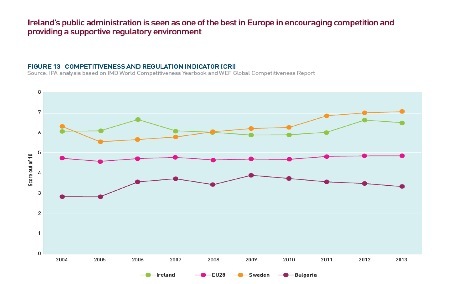 Noteworthy also is the fact that our public administration is seen as one of the best in Europe in encouraging competition and providing a supportive regulatory environment (See Figure 3, Appendix 1). 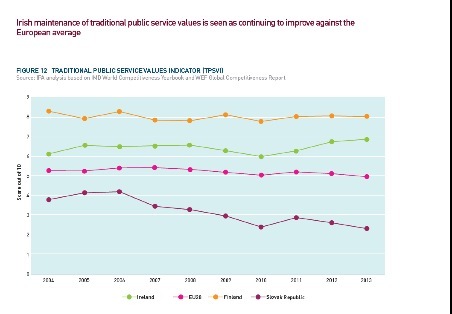 Ireland’s score on an indicator ranking the upholding of traditional public service values such as independence from political interference, freedom from bribery and corruption and reliability and administrative fairness has improved in each of the last 3 years (See Figure 4, Appendix 1).. But we recognise that we have considerably more work to do if we are to aim to be at the leading edge of public administration in Europe. We are delivering of course. Ireland’s Presidency of the Council of the European Union last year is a case in point. A Presidency that was widely recognised and admired for its effectiveness, pragmatism, and professionalism. Over 181 days of our Presidency, 2,477 meetings were chaired by Ireland. During this term, Ireland achieved agreement on vital elements of a banking union, as well as agreement on the Union’s budget of almost one trillion euros for the next seven years. This example reflects well on the many strengths of the civil service. Success on that scale doesn’t come without significant commitment. This was a difficult period for our country but I argue that the programme was managed well. These are good examples of the core values of the Civil Service coming to the fore. It is essential that any change to the current accountability arrangements should not damage any of the values which have been the bedrock of our Civil Service. So we have a certain amount of accountability through our legislative obligations and our answerability to the Oireachtas. We also have a certain amount of accountability through the public nature of the work that we do and the services we provide. But it is not enough. I believe that strengthened accountability arrangements are needed in the Civil Service. This is evidenced by the recent extensive internal and external consultation processes undertaken by my Department. This need stems from the reality that the status quo, however assessed, is no longer good enough. The Civil Service needs a new chapter. It needs to be more effective, more responsive and higher performing, and this must be clearly evident to the public. By strengthening accountability, the Civil Service and our political system can be empowered to work better together to get more done. This will help build trust – trust that informed choices are being made – trust that correct procedures are being adhered to – and trust that public money is being spent in the most effective way possible. I would now like to tease out options for further change. aligning recruitment and promotion practices with HR requirements. An extensive public consultation process was managed by an Independent Panel chaired by Prof Kevin Rafter. The Independent Panel’s core recommendations are clear. They recommend establishing an Accountability Board for the Civil Service with external oversight. This Board would review and challenge senior management performance as well as monitoring progress in the delivery of strategic priorities. The Independent Panel also recommends designing a performance management system for Secretaries General. In addition, the Independent Panel endorses publishing ‘who does what and to whom they are answerable’ at the level of Assistant Secretary and Principal Officer. The Independent Panel also recommends the reintroduction of Organisational Reviews – these reviews would be intended to provide an objective assessment of the capacity and capability of Departments. I strongly support these recommendations. Over the coming weeks, Government will be finalising a Civil Service Renewal Plan which will consider the recommendations of the Independent Panel and the ideas developed internally by the Civil Service Renewal Taskforce. This Renewal Plan will set out an integrated pathway to develop the future capability and capacity of the Civil Service. This Renewal will help support a higher performing and more accountable Civil Service – higher performing organisations and higher performing staff. Of crucial interest when the topic of greater accountability is debated is the question of performance management and our capacity to tackle under-performance in the Civil Service. Indeed in the mind of some commentators this is the only issue – which of course is patently not the case. I want to make clear that I see strengthened accountability as a way of improving performance across the board in the Civil Service rather than primarily as a means of addressing poor performance although this is important. We must focus on the vast majority of civil servants who are doing well and see how we can bring their performance up to an even higher level. The value added of such an improvement across the whole Civil Service population would deliver significant dividends in terms of more effective policy formulation and delivery of public services for many years to come. In my experience, the number of people who consistently underperform is a low proportion of the workforce but underperformance at any level should not be tolerated. We are working to ensure that the Renewal Plan incorporates practical and specific actions that enable us to make progress on this issue and enhance performance and capability. We need to support our managers in implementing these measures where any under-performance or non-performance is identified. Proposed measures would include greater professionalisation of HR, easier access to legal supports and more practical support for line managers in dealing with difficult performance issues, and ultimately in taking tough decisions. Managing and strengthening performance in any work environment presents challenges. We need to remember that employment law applies equally to the public and private sectors. In the public sector, there is scope to apply disciplinary procedures up to and including dismissal, where appropriate. The private sector has, of course, more financial freedom to address these issues. Let’s be frank – in the private sector senior people can be compensated for agreeing to leave with full assurance of confidentiality which protects everyone’s reputation – the organisation’s and the individual’s. Financial transparency and financial constraints exist in the Civil Service which makes this approach impossible. I would welcome an open debate as to the extent to which there would be support to adopt similar approaches in the public sector. We need to have a workforce that fits the business needs of the current environment. In this context, the issue of pay is important. We need a sensible discussion on pay which focuses not just on the cost but on value. We need to pay the going rate for the job but must ensure that we have a professional service that is accountable. I think the public are willing to pay if they are paying for accountable public servants who are seen to deliver. Building on what we have already achieved, I believe that greater clarity and common understanding of the work still to be done will assist in strengthening our performance. The Civil Service Renewal Plan informed by the recommendations of the Independent Panel and the Civil Service Task Force will provide a strong foundation to our ongoing reform work. This will be a public administration that is more responsive and efficient, focused more on the needs of service users and less on traditional organisational boundaries. It will be an administration that is dynamic and strategic in its decision making. And it will be more accountable.